Click to view this email in your browser. 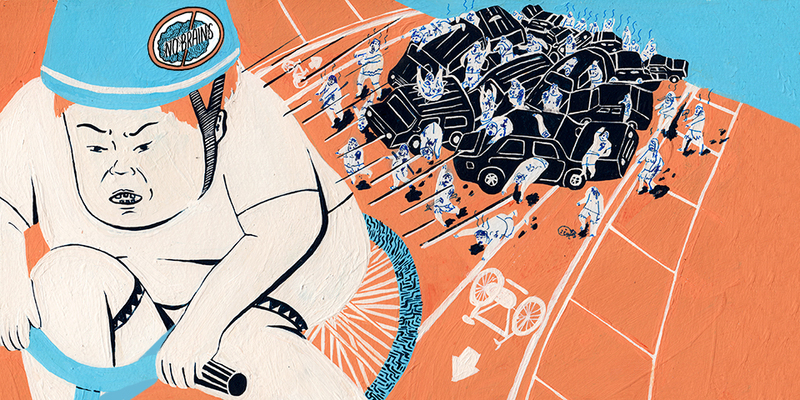 October means Canzine, art, bikes, zombies and Halloween! October has been a busy month for dandyhorse and all things bike related. We participated in Nuit Blanche, attended the Ontario Youth Bike Summit and continued with our series on the proposed Harbord bike lane makeover. And this month's fun is not over, we are still looking forward to the upcoming Canzine festival, and of course Halloween! Toronto's all night city-wide art festival, Nuit Blanche, seems increasingly popular with, well, everyone. This year's insane crowds made it difficult to tour the art-filled city by bike, while at the same time much of the city's art was bike-filled. Chinese dissident artist Ai WeiWei wowed the throngs of spectators/art-zombies who ventured to Nathan Philip Square to see what a 3000-bike art sculpture looks like up close. And dandyhorse helped out with the Kim Adam's exhibit of his intriguing two-headed bikes, which force users to question the meaning of relationships and cooperation in our postmodern, late-capitalist, urban-individualist society (or something like that). Maybe not as exciting as an all night art party, but definitely as inspiring, was the inaugural Ontario Youth Bike Summit which took place over October 6-7 at North York Civic centre. The event, hosted by Share The Road, had youth leaders from across the province come together to discuss bike advocacy and planning strategy with bike policy experts, and ended with a youth presentation to MPPs at a closing reception at Queen's Park. Speaking of bike policy and planning, this month we continued our ongoing coverage of The Mysterious Case of the Harbord bike lane. Our latest installment follows the trail of bread crumbs found between the Harbord Bakery, The Harbord BIA offices and City Hall. While details continue to surface, the mystery of the dissappearing bike lane between Spadina and Borden remains unsolved. dandyhorse is also super-bram-stoked to be participating in this years Canzine festival. Canada's largest festival of zine and underground culture is coming to Toronto this Sunday, at the 918 Bathurst Centre. dandyhorse will be there with our friends at Broken Pencil, and we'll have our latest issue available. We recently talked with Ian Sullivan Cant of Broken Pencil about independent media, zine culture and the Canzine festival. When the evil anti-bike forces rear their ugly heads, a great way to be reminded of the terrific cycling community we have here in Toronto is to go on a group bike ride. And October means we can express our own, much more creative take on being ugly monsters with this month's costumed Halloween rides and celebrations. The critical mass Halloween ride critical mask will take place on Friday, October 25. 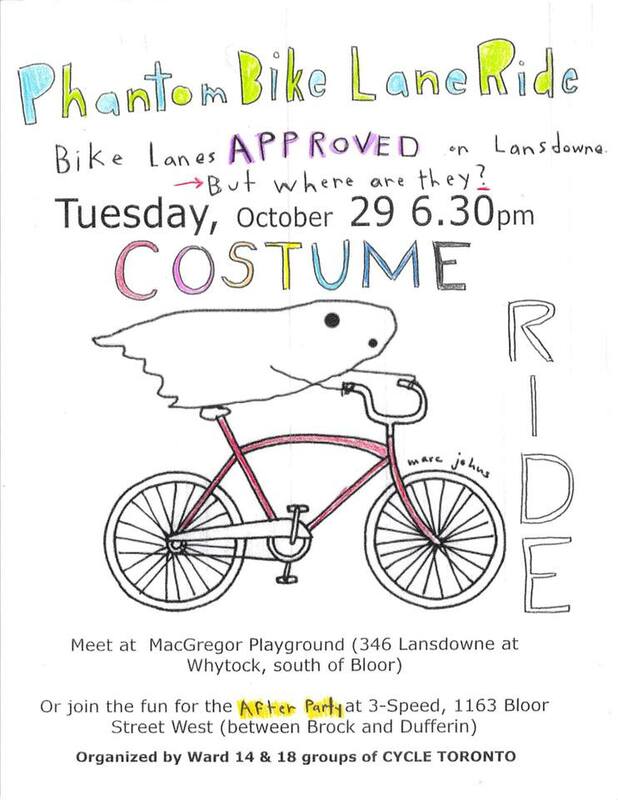 And Cycle Toronto (which suspects that the bike lanes approved for Landsdowne must themselves be celebrating Halloween by dressing up as invisible ghosts) will be hosting a Phantom Ride along Landsdowne on Tuesday, October 29. If you are left wondering about the connection between zombies and bikes, dandy contributor Albert Koehl solves that mystery in his new short essay. We all know the zombie apocalypse is just around the corner, and as cyclists we already have the jump on survival. Find out why in Avoiding the Zombie Apocalypse by Bike. Illustrated beautifully(and seen above) by new dandy contributor Ness Lee. Ness Lee will be at Canzine this Sunday Oct. 20, too. So many great events still to check out this month! 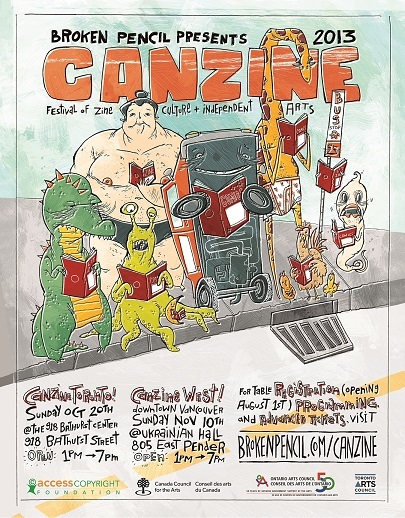 This Year's Canzine festival of zines and underground culture is this Sunday, October 20! dandyhorse will be there and we'll have our latest edition available. You can find us with our friends at the Broken Pencil table. Hope to see you there! At 918 Bathurst centre, Sunday 1-7 p.m.
Clay and Paper Theatre's 14th annual Night of Dread on October 26 is an evening of costumed wonder not to be missed! Copyright Â© *2013 *Dandyhorse Media Inc.*, All rights reserved.